Time: Earliest sightings in the 1800s, local folklore preceding this. Mysterious creature sightings occasionally venture into demon lore, leading to rampant speculation by cryptozoologists, and also by believers in the supernatural. The legend states that Mrs Leeds 13th child was the spawn of Satan himself, and after birth, transformed into a long legged, winged, horse-headed demon with hooves. Subsequently, sightings of large flying creatures and livestock killings in New Jersey have been blamed upon this demonic creature, the Jersey Devil. Attempted explanations vary; some cryptozoologists endeavour to explain the Jersey Devil as a flesh and blood creature, like a pterosaur or large bird, but it is also suspected that the story may have been created to vilify a local politician named Daniel Leeds. Some think that the sandhill crane may be responsible for the alleged devil sightings, as both are large, long legged flying creatures. Probably, the story is yet another example of a mythical bogeyman, created to scare and entertain locals. It seems that the folklore has turned the Jersey Devil into a cultural icon, with sports teams and local aircraft named after it, and many references to it in popular culture. But if the pine barrens of New Jersey did indeed play host to such a creature, we could still refrain from the supernatural in our speculation. The Jersey Devil (Megavampyrum demonicus) is no devil or demon, but an exceedingly large, predatory bat, with a wingspan of 3 metres and a standing height of 1.6 metres. Most commonly seen in the pine barrens of New Jersey, its distribution also extends further west into Pennsylvania and north into Connecticut and New York State. Unlike most bats, it has long back legs that enable it to stand upright when the need arises, it will also move on the ground by “walking” on its hind legs whilst flapping its wings for balance. Feeding mostly on smallish game like opossum, racoon, roosting birds, lizards and frogs, it descends on them from above, biting savagely with its sharp teeth. Due to the temperate climate within its range, it has a long coat of bushy brown fur, and its wing membranes are covered with fine, velvety hair that also softens the sound of its wings. Echolocation is reduced in the Jersey Devil, and mainly used to communicate during breeding season, it tends to hunt by sight and smell. Being primarily nocturnal, daylight hours are spent roosting high in the branches of pine trees, where it clings using its large fore claws instead of its long legs and feet. 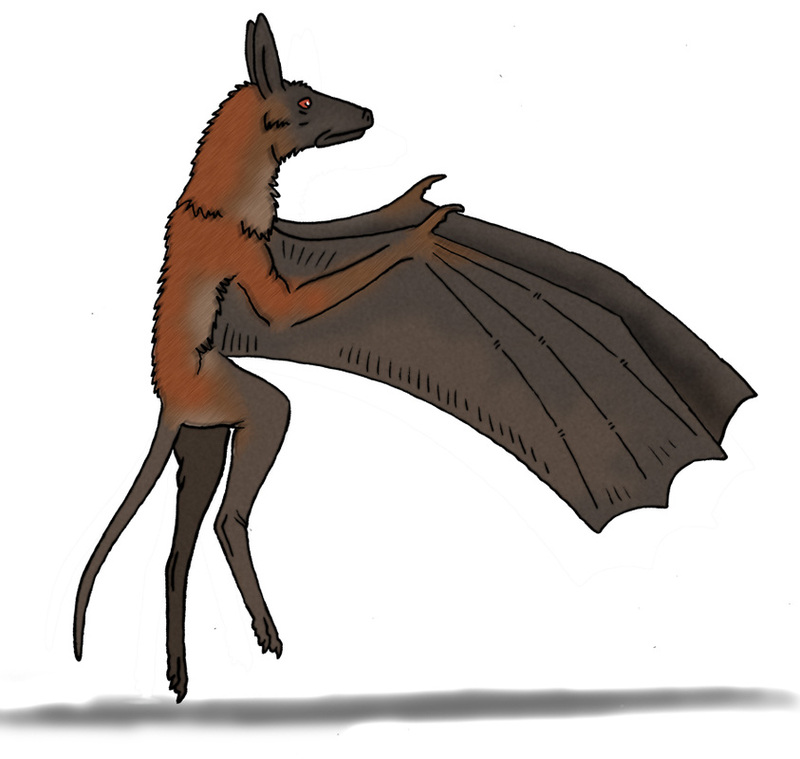 It appears to be descended from bats similar to the genus Vampyrum, but the many distinct adaptations of the Jersey Devil warrant its own family grouping.